I have a potluck to attend on Saturday and have been toying with ideas of what to bring. I recently bought a new baking pan in the shape of a Jack O’Lantern. I decided to make use of it since it had been sitting in a cabinet and also since I hadn’t baked anything vegan in a while. Let’s be honest, I was getting sick of separating eggs because they’re gross and slimey and ugh. Below is my recipe for a cinnamon crumb (or coffee) cake. Preheat oven to 350 degrees F and lightly grease a round cake pan (or in my case, a festive Halloween pan). Mix together the flour, 3/4 cup sugar, baking powder, and salt. Using a cutting board, cut the margarine into small chunks (I cut them into 4’s) and add them to the mix. Mix for a couple of minutes with a hand mixer. This is your “dry ingredient” mix. Remove 1/2 cup of the dry ingredient mix and put into a separate bowl. Add the cinnamon and 2 tablespoons of sugar, mix together well. This is your “topping”. To the remaining dry ingredient mix, add the soy yogurt and milk and mix until the consistency is smooth. Put the batter into the round cake pan and spread evenly. I used a rubber spatula to spread it around. Spread the topping evenly onto the batter. Melt 2 tablespoons of margarine in the microwave for about 30 seconds. Drizzle the melted margarine over the the batter and with the topping. Bake the cake for 35 minutes or until a toothpick comes out clean. You’ll see in my photo below that I didn’t cover the facial pieces because even though I was eventually going to flip it, I wanted to test it out with some icing eventually. Keep in mind that this cake is not very sweet. I’m sure you could make it sweeter if you modified it a bit but since I don’t have much of a sweet tooth, this was perfect for me. I also cannot wait to use this pan again. 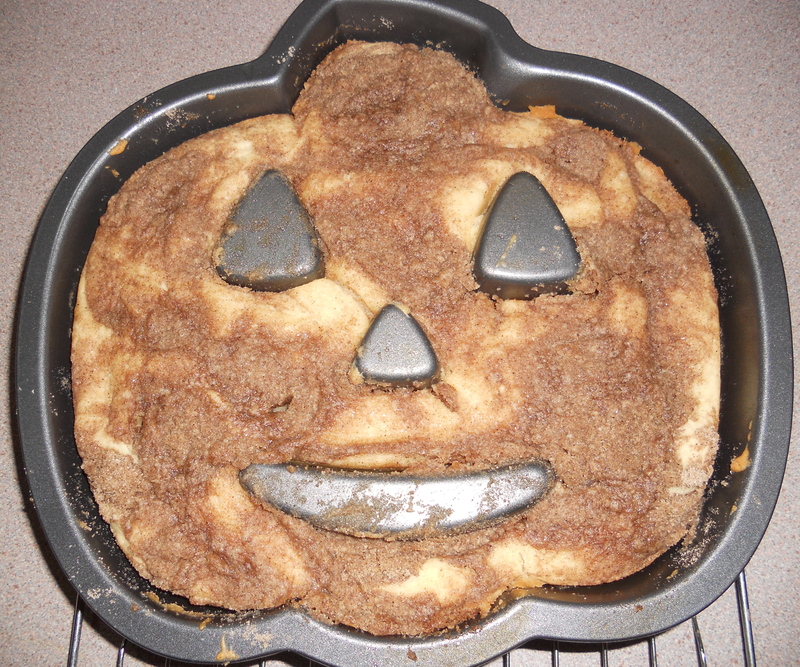 This entry was posted in Baking and tagged Baking, Coffee Cake, Crumb Cake, Vegan Cake. Bookmark the permalink. This looks awesome! I want a bite!